Below is the interview that Reporter Tom Baldwin of the Home News Tribune conducted with me shortly after we met @ a Tea Party event on a rainy night in November in Sayreville, NJ. It is a very accurate piece. In getting to know Tom I asked him to provide some insight into the government he experienced when he lived for several years in Lebanon - it is right in line with one of the themes of ReturnToExcellence.net & I will present it shortly. SOMERVILLE — It just makes sense, says Doug Hartlove, to tax people on what they buy and not on what they earn. Why, asks Hartlove of Somerville, go for a system where people pay up to 40 percent of what they earn when they can pay 23 percent of the amount they choose to spend. 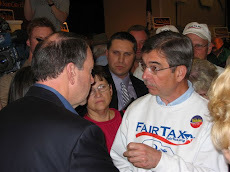 Hartlove, a retired engineer who has been all over the world designing and building chemical plants, now travels across New Jersey seeking out groups to address about the merits of a little-known national movement called the "FairTax." He says he has not won many converts, but his energy seems boundless. The FairTax plan, its creators say, "is a comprehensive proposal that replaces all federal income and payroll-based taxes with an integrated approach, including a progressive national retail sales tax." Although Hartlove said the idea is common sense, he has been slow to enlist advocates. Most of his audiences, he says, have been TEA Party supporters or other conservative groups. Hartlove, volunteer state director of FairTax New Jersey, says people would see their entire salaries in their paychecks or pensions free of federal taxes, under a FairTax, and would not be taxed on purchases of basic necessities. Hartlove also says a new form of taxing would make U.S.-made products more competitive in overseas markets. He says a manufactured good would not have an accumulation of built-in taxes, such as on the sale of materials that went into the product. Those taxes, Hartlove says, would eventually drive up the cost of the finished good. Hartlove says a FairTax would bring transparency and accountability to tax policies, ensure Social Security and Medicare funding, close loopholes and bring fairness to taxing in general. "It is the most important piece of legislation in our lifetime for America," says Hartlove. "This is the biggest transition of power from the politicians to the people since the founding of our country." Doug, I loved the way you made all the points in the interview simply and clearly. I could feel that the interviewer got the message well. Good job. Thank you for the Christmas video. It was soul-stirringly beautiful. I will share it with many others. Sorry to burst your bubble, but Fairtax is a giant farce. Oh it sounds great, I used to be a big fan. Then I noticed some odd things -- like hidden in their fine print are massive new taxes. Like how the "prebate" works and what it costs. I started to ask some questions. Sadly, Fairtax leaders have knowingly distorted the FUNDAMENTALS. It's not even a tax on people as much as it is (in their fine print) a massive new tax on city and state governments. Forget for a moment if that is even possible, why on earth would they hide this massive new tax in their fine print? 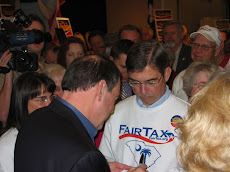 Many well meaning people have been suckered into this farce - not one of them realize the fine print in Fairtax is drastically different than their hyped plan. The plan they brag about in their web pages and headlines is nothing like what appears in their fine print. Plus, the nonsense about "untaxing the poor". That could not be more false. First, there are NO exceptions. None. Absolutely none. No exception for rent, or medical cost, or cancer surgery, none. For anyone. Which may sound great, but remember, Fairtax math is actually based on this "principle". No exceptions. So the parents of a child with leukemia MUST pay -- no exceptions -- the world's highest sales tax on their child's chemo and surgery. What if they only make 20K a year? Fairtax insists SOMEONE must pay that tax. There math is absolutely based on it. If that person (or someone) does not pay it, then Fairtax collapses, they admit themselves. If there are ANY exemptions, Fairtax leaders have said, for ANY thing, then it's not Fairtax. If the GOVERNMENT pays for the cancer surgery, then the government must pay the tax. If the Pentagon pays for a soldier's health care, then the Pentagon must pay the tax. There simply are NO exceptions AT ALL. But the government paying itself is pure nonsense, it creates nothing. Fairtax math pretends it's income to the federal government. The "prebate" was supposed to cover all that. But the prebate is 200 a month. That's it. That's all it is, ever. It does not go up if you have cancer. It's 200 a month, period. Even that would cost 600 billion a year -- and Fairtax has never explained how they will pay for that. But the 200 a month per person will not begin to pay for the taxes on the health care of cancer victims, or ALS patients, or whomever. Fairtax is a farce. It's not sort of a farce, its not kind of a farce, it's complete and utter nonsense. It's own leaders know it. The Income Tax system is a psychotic legal system and only gets worse year after year after year. 7 Billion Hours in attempted tax compliance. The Income Tax code itself is 70,000 pages of arbitrary and contradictory laws and opinions. This plus at least a million more pages of Revenue Rulings, Letter Rulings, Tax Memorandums, Tax Publications, Tax Court, Federal Court and Supreme Court Opinions that are written in an effort to explain the mind numbing Income Tax code. Most personal, financial and business decisions all have to take into account the Income Tax system and generally require assistance from tax accountants and lawyers who themselves do not even understand the Income Tax code. Seeker is attempting the old NPR trick of raising an emotionally charged case, here a child with leukemia, and then asking the reader to extrapolate. My father, who was a successful attorney, said often, "hard cases make bad law." Better policy is to legislate to the norm, not to the exception. Seeker's argument that the FairTax is regressive is based on a widely-held misconception about family resources. People tend to look at resources through a one-year window. That approach is wrong. Economists consider average remaining lifetime resources of any family unit, and then discount them back to present value. With this approach, it becomes clear that the FairTax benefits lower and middle-income people disproportionately. There are several reasons for this result. First, the FairTax eliminates the two most regressive taxes that exist today: the payroll tax and the tax costs built into the price of every good one buys and service one uses. These costs burden the poor disproportionately. Under today's tax system, people experience welfare loss as they move away from the Earned Income Credit. The FairTax replaces the EIC with a prebate, which eliminates that unfair result. Finally, the FairTax is a wealth tax. All wealth, on a first-in first-out basis, is consumed over time. It is just a question of when. The FairTax gets at wealth when it is consumed. The Income Tax and FICA Tax do not. Positive dynamic effects of the FairTax help the poor yet further. By the way, Seeker, the parents of the leukemia-stricken child will probably be forced into bankruptcy today anyway. The FairTax removes the tax disparity that leads to today's out-of-control healthcare costs. The FairTax makes it more likely that the child's parents will survive financially.